Railway Paths Limited was established in 1998 in the wake of the privatisation of British Rail. 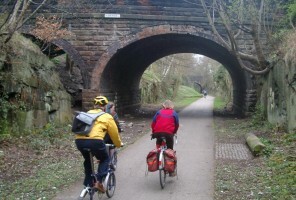 Sustrans, the charity developing the National Cycle Network, had previously acquired old railway routes from British Rail on a project by project basis. The idea of transferring a large portfolio of disused railway routes came about as a way of making expansion of the National Cycle Network through using land previously owned by British Rail quicker and simpler. Thus Railway Paths Ltd was set up as a focussed organisation, independent of Sustrans, with specialist staff to manage a large amount of land and structures. Railway Paths works closely with Sustrans. The two organisations share similar objectives and refer to each other as “sister charities”. Nevertheless, Railway Paths is an entirely independent charity, with its own board of trustees. It receives no financial support from Sustrans, and the two organisations are financially independent. The two organisations share some resources and expertise, and our service agreement with Sustrans for administrative support has been vital for our success. Sustrans provides Railway Paths with ‘back-office’ support, including accounts, legal, IT and HR, and we provide Sustrans with estate management and engineering services to manage their own properties. We also share premises in Birmingham and Manchester. We have a proactive programme with Sustrans Regional Managers to ensure the wise use of the remaining portfolio*. Where Sustrans operates a path on land owned by Railway Paths there is a formal arrangement setting out both parties’ responsibilities for maintenance and management. *Where we own land that neither we nor Sustrans can see a use for as a cycle path, we look to develop or sell it.